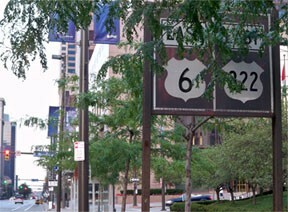 For the first 45 years of the US highway system, four routes shared a terminus on Public Square. US 21 was decommissioned in Ohio in 1971, but the remaining three routes still end there. 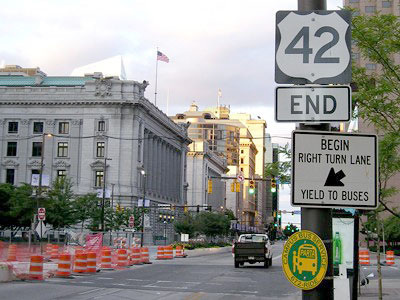 The intersection of Superior/Ontario was the original endpoint for all routes, and probably always the intended endpoint, and it is still the actual endpoint for US 422. However, according to Ohio DoT's Straight-Line-Diagrams (SLDs), the official endpoint for both US 42 and US 322 is now one block to the east (more on that below). 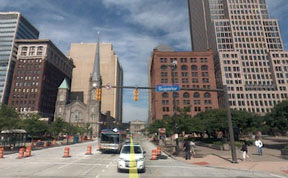 The north edge of Public Square is formed by Rockwell Avenue, while "South Roadway" runs along the south side (in other words, these are the sides of Public Square that are parallel to Superior). 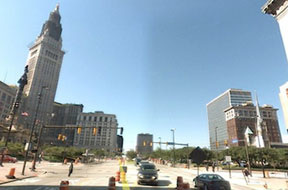 The west side is called "West Roadway", and the east side of Public Square is bounded by "East Roadway" (these are parallel to Ontario). At some point, left turns were banned at the intersection of Superior and Ontario. 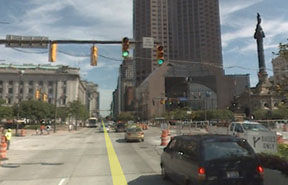 Presumably accompanying this change, these roads running along the outer perimeter of Public Square were converted to one-ways, such that they now essentially function as a giant counter-clockwise rotary surrounding Superior/Ontario. 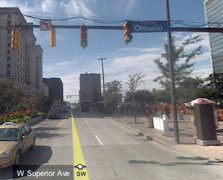 So today, drivers wanting to make a left turn from Superior to Ontario (or vice-versa) should instead turn right one block before the intersection, onto Public Square. 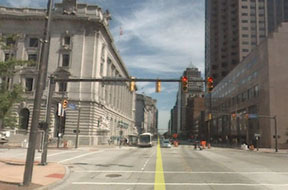 After one block, they turn left (staying on Public Square), and then in one more block they can make another left turn, onto their intended street. (Alternatively, one can drive through the Superior/Ontario intersection, make two lefts, and then a right.) Anyway, I suspect this diverting of Superior/Ontario traffic onto Public Square may have been a factor prompting ODOT to change their SLDs, relocating the endpoint of US 42 and US 322 to the east side of Public Square. In my opinion this is an unfortunate technicality that obscures the original intention for all highways to converge at the Superior/Ontario intersection. 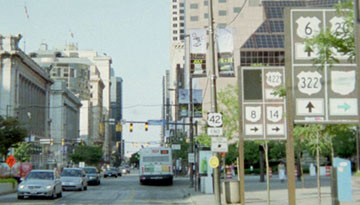 ​US 422 begins there, to the right on Ontario. The blank quadrant has a black panel covering a US 21 shield pointing that direction as well. 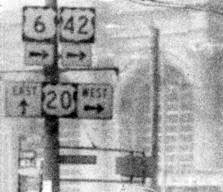 Despite the fact that US 21 was decommissioned from here in 1971, the US 21 shields remained on display at this intersection for almost another three decades (until 1998 or 1999). Marc offers an explanation for this: he has found photos from both 1976 and 1978 showing standard (standalone) ODOT markers at this intersection, including one for US 21. He suspects that the creators of these "Public-Square-style" signs simply copied the routes that had formerly been posted at the intersection... including US 21, which ODOT had not replaced with SH 21 signs in a timely manner. 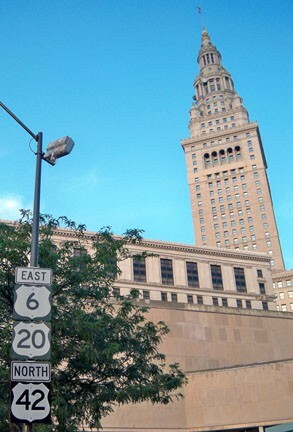 ...however, unlike eastbound Superior, signage heading this direction is almost non-existent... which is perplexing, because in order to follow any route other than westbound US 6-20-42, one must make a complicated "Public-Square-left-turn" (described in the intro). One way to do that would be to turn right at this intersection, using E. Roadway and then Rockwell. But neither of those roads are actually on the state highway system, so maybe that is why this turn is not signed. However, there does appear to have been a half-baked attempt to sign that movement: heading north on E. Roadway, there is a "US 422 (left arrow)" sign. Then, heading west on Rockwell, there are signs directing OH 8-14 traffic to turn left on Ontario (but no mention of US 422). That was taken from the same perspective (south on W. Roadway) by a newspaper photographer in 1978. 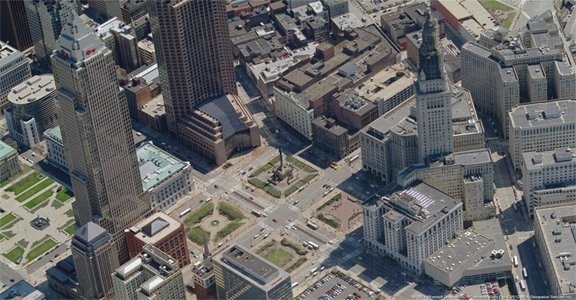 In summary, Public Square is a fascinating intersection: all the highways that converge here attest to its significance to the city of Cleveland. While highway signage does abound here, there are nevertheless several omissions, in addition to several idiosyncrasies and/or mistakes.